XLT Special Edition Package! Sport Package! Navigation! 3.31 Rear Axle Ratio! 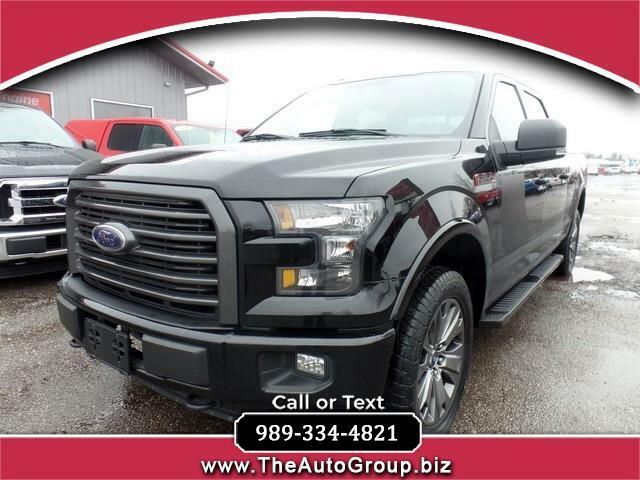 A thoroughly modern full-size pick-up, our award-winning 2016 Ford F-150 XLT SuperCrew Sport Four Wheel Drive is proudly presented in Shadow Black! Powerful, yet efficient, the 5.0 Liter V8 executes flawlessly to generate 360hp while tethered to a durable 6 Speed Automatic with Sport and Tow/Haul modes. You ll dominate the road with incredible towing and payload capacity all while scoring near 21mpg on the highway! Our Sport is one sharp-looking truck with its Black billet-style grille with body-color surround and Black mesh insert, Sport box decal and prominent alloy wheels. You ll be comfortable inside the well-thought out cabin with clever storage, power accessories, and cloth seats. Stay safely connected thanks to Ford s Sync voice control smartphone integration system, while taking advantage of Bluetooth phone/audio connectivity and USB/auxiliary audio input jacks. Now buckle-up and enjoy this solid, composed ride! Drive with confidence knowing this is a lean muscular machine with a high-strength military grade aluminum-alloy body and high-strength steel frame. You ve also got anti-lock disc brakes, stability and traction control, trailer sway control, front-seat side impact airbags and full-length side-curtain airbags to help keep you secure. Tried and true, this reliable truck is an incredible choice! Get behind the wheel of our F-150 today! Print this page and call us Now... We Know You Will Enjoy Your Test Drive Towards Ownership! Visit Auto Group Leasing online at www.theautogroup.biz to see more pictures of this vehicle or call us at (877) 772-1113 today to schedule your test drive. **IMPORTANT WARRANTY INFORMATION** Please contact or visit the dealership for complete warranty coverage details. While every reasonable effort is made to ensure the accuracy of this information, we are not responsible for any errors or omissions contained on these pages. Please verify any information in question with Auto Group Leasing LLC at (877) 772-1113 or e-mail: salesteam@theautogroup.biz.